Happy New Year. I am starting off the year with some tips and tricks to get you the “biggest bang for your buck” in the shortest possible time. It is easy to build motivation if you can see rapid change. 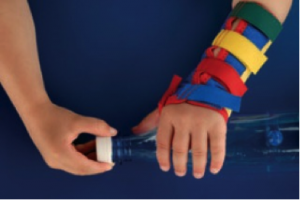 This wrist and thumb splint was shown to produce an immediate improvement in bimanual activities in children with hemiplegic cerebral palsy. This simple wrist and thumb stability brace1 is similar to braces I have seen in Canada and the USA, but most of the ones that I have seen lack the bright contrasting colors. In children with hemiplegic cerebral palsy or brachial plexus injury, there is one functioning hand that is preferentially used for all unilateral activities. The impairment problem arises when the child has to use both hands in play, activities of daily living or even in therapy. The study design of this paper is elegant.2 The study children all had mild to moderate hemiplegia and ranged in age from 4 to 11 years with a mean age of 8 years and 4 months. Children with a tightly fisted hand were excluded from study. The children were tested using the Assisting Hand Assessment (AHA) at baseline without the brace. One week later, they were tested again, immediately after putting on a brace. The brace was only on the child for the time it took to do the AHA. Then the brace was removed and one week later, the child had another test without the brace. There was an immediate and powerful improvement with the brace when compared to either the baseline or post-intervention AHA results. In statistical terms, there was a whopping p<0.001 increase in bimanual hand use with the brace. In a rational world, well-designed studies like this would have produced some change in clinical practice. Not so! 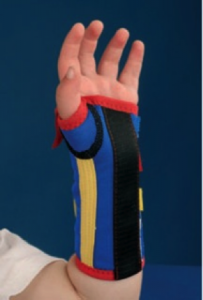 I think it is fair to say that the majority of children with unilateral or bilateral wrist/thumb problems do not have appropriate bracing that is used consistently during the day, during therapy, and in more severe cases during sleep. In my view, this is wrong. The basic underlying problem is the imbalance of muscle forces produced by damage to the brain in hemiplegic cerebral palsy and by damage to the nerves in brachial plexus injury. In both problems, the flexor muscles of the forearm contract more strongly than the child can activate the extensor muscles. They need to have both working to stabilize the wrist. When there is flexor dominance, the wrist is pulled down into flexion whenever they try to grasp or hold an object. They are unable to correct this imbalance on their own. Trying to do therapy with the hand in flexion only teaches them “how to do bad better”. Remember, brains wire in whatever movement pattern we use and the most important point is to wire in good movement patterns. This is not an abstract argument about which pattern “looks” better. With the brace on, the children were able to independently grasp objects of different shapes and sizes with the affected hand. They were able to open their hand and hold objects such as a bottle or marbles with a more powerful grip. Follow this link to a post that explains how grip strength relates to wrist position. There is a good list of available braces at the end. How Strong Is Your Hand? Once you understand the importance of proper alignment of the joints, spend just one day really looking at your child’s hand position and notice how many times the wrist is flexed forward. Then capture some still photographs of this abnormal position during function and show it to your therapist. Learning to become aware of the hand and using it, as a “helper hand” is the first, and most important, step to function. This type of support is even more important for children with quadriplegia. If both wrists and hands are involved, I suggest starting with a brace on the most functional hand so that the child learns quickly that the brace is helpful. Once you are over the initial hurdle of wearing the brace, then both sides should be braced. The job of the parent is to document how much time the child’s hand is in the wrong position for function. Then you have to share this information with both your therapists and physicians. It is their job to help you pick the most appropriate support system. In my experience, most children should have a variety of support systems. They need quite rigid supports when the arm is being used for support as in crawling or holding on to the handlebars of a bicycle or walker. They may need less support, such as a thumb splint, when sitting and doing hand activities. I am quite sure I will hear from people attempting to justify the non-use of braces. There are many who will not be satisfied with positive trials until there are multiple randomized controlled trials (RCT). This view is the dominant paradigm within pediatric rehabilitation. If the known functional results in teens and adults were better, I might be more understanding of a course of action that will take years to complete. Unfortunately, the data clearly indicates that our current methods of treatment are not producing useful bimanual activities in the majority of children. Further, when teens and adults are asked about functional problems, difficulties with the affected arm and hand is their most significant imparment.3 I would like to hear from therapists who agree with my position, with stories of how they use splints and braces to improve function during the critical learning years. Please send me some “before and after” photos with the splints you find work best for your child. I am happy to learn of more products that work. I frankly do not understand why the majority of therapists and physicians so consistently ignore this important step of stabilizing the wrist and positioning the thumb in a useful position. The data is in, the technologies are effective, and the children need help. It is time for parents to become “empowered” and take charge of their child’s alignment issues. 3. Fedrizzi E, Pagliano E, Andreucci E, Oleari G. Hand function in children with hemiplegic cerebral palsy: prospective follow-up and functional outcome in adolescence. Developmental Medicine & Child Neurology 2003 Feb;45(2):85-91.
thanks for all the tips Karen… I agree that splinting could be useful even when (or especially when!) both arms are affected (e.g. quadriparesis). Do you have specific splints (brand names) to recommend in this situation? We bought the McKie thumb splints, but they do little for the rest of the hand… Thanks! Hi Anna, You make some good points. There are a wide variety of commercially available splints and upper limb supports.Unfortunately, it is not a “one size fits all”process.The McKie is great for getting the thumb in a good position. IF the child is sitting at a table with support to the forearm, it may be the best for teaching fine motor skills. You may need more support to control the wrist for bimanual play and that you should discuss with your therapist. The important thing to remember is the goal – a hand and wrist in good biomechanical alignment. I am not sure about the distribution of this particular splint. I would suggest you take the blog post to your therapists and ask for their help. I am reccomending support if the hand use is abnormal, but the exact choice of which splint should be done by a therapist or doctor who knows the individual child.Hope this is of help. Hello, Dr. Pape, thank you for the wonderful information you share on your blog. How do you feel about kinesio taping vs. bracing for an almost 3 year old with mild hemiparesis? We have tried bracing, but the tape allows her to have more freedom of movement and greater ease grasping objects. She will also take off the braces we have tried (Mckie with supination strap), with the exception of the Spio glove. Great question Beatriz.If the child’s skin can tolerate prolonged use, then kinesiotape is a great option when sitting and playing or eating. However, most kids also need to use a SPIO glove or McKie or Benik or DMO…there are lots of choices…when they are active.When little ones are doing gross motor activities, especially new or exciting activities, they often tighten up with “overflow tone”. So the hand tends to fist more when running, etc. It is important to control this with stable splinting. Hi, are you still active on this website? It’s all very interesting reading. I’m fairly convinced my twin boy has some form of CP, he’s 7 months old now, first saw consultant at 5 months, now in physio, everyone reluctant to make any diagnosis as yet. The right hand is the obvious issue, and several doctors/physios have now said they can’t see any issues with the rest of his body. It all feels a little bit stiff to me, compared with his twin brother and other babies I’ve known he doesn’t feel quite normal. Is it even possible to be so localised? Waiting on MRI and blood tests etc. Also – I asked the physio about getting him a hand splint to encourage him to keep it open and she said no, that won’t achieve anything, we just need to work on him actively using it himself. What are your thoughts on this? Again read my book for many thoughts on this.The key to change is knowledge and sharing current research and best practices with your therapy team is a good place to start. Thank you for your comment. Yes, I am still active on my website, but lately I have been very busy with the launch of my new book. I hope to be more regular now. If you read the book, I am sure you will find the answers to many of your questions. The blogs are “added value” to the book, not a replacement.I am pleased that you are at least getting some testing done and hope it will result in you getting some answers soon. For now, I would push to be referred to a physiotherpist for some ideas on how to help him progress. Hi, I’m reading your book now, thank you. I’ll let you know if I have any questions from it. For now from what I’ve read I’ve taken it upon myself to order him a hand splint at least to use at night – as he’s keeping it clenched tight at night which can’t be good.